My friend and I were looking for something to eat at SM Food Court last weekend when we chanced upon this food counter with lots of customers queuing up. I got curious so I went near it and looked at the display. 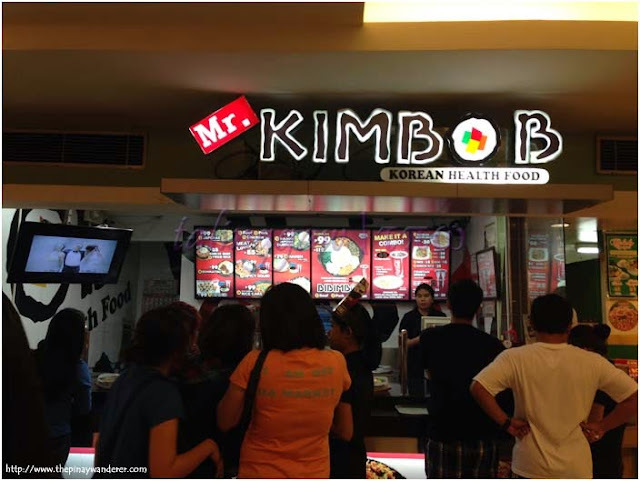 The food counter is Mr. Kimbob, a quick service Korean restaurant chain serving Korean dishes at an affordable price. 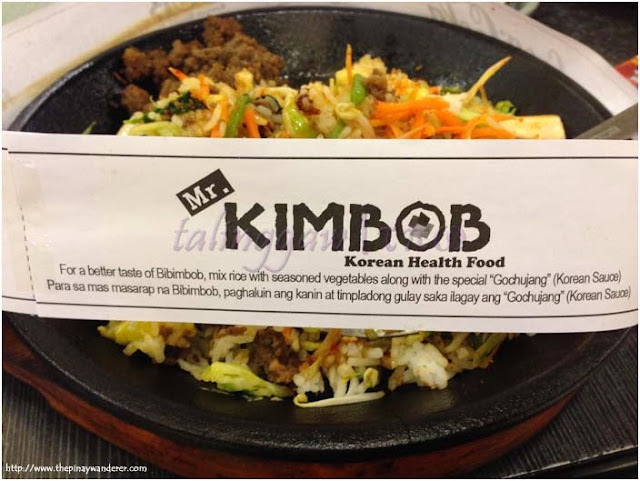 I check out the orders of the other customers and noticed that most of them ordered a meal combo on a sizzling plate with rice and sunny side on top surrounded by colorful veggies, much like how Koreans prepare their foods (as I saw it on Koreanovelas). It made me more curious so I stood in line and also ordered for it. My friend who's not as adventurous as me when it comes to food left and look for something else. 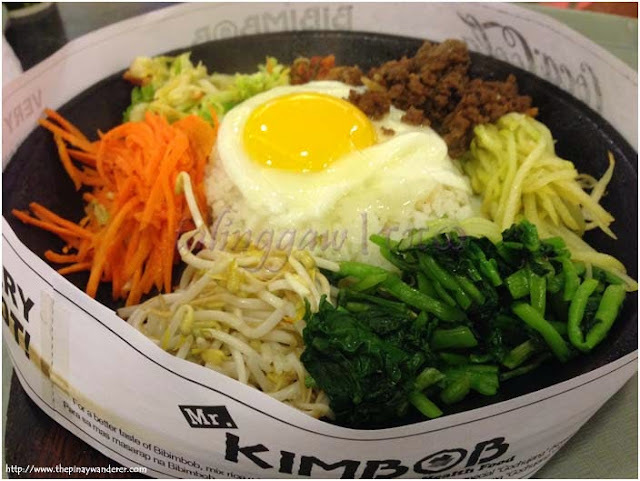 Anyway, the combo meal I'm referring to is bibimbap or bibimbob, as Mr. Kimbob called it. 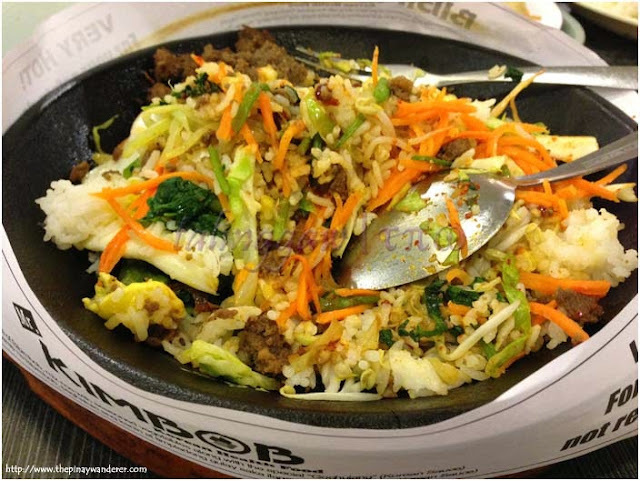 It is a Korean dish consisting of rice with fried egg (sunny side up) on top and various kinds of colorful veggies surrounding the rice (see photo above). The included veggies are carrots, bean sprout, watercress, cabbage, kimchi and another veggie (I think sayote). It also had ground beef (can be pork, chicken or beef) on the side. It was served with sesame oil and gochujang (Korean sauce) as flavoring/seasoning. 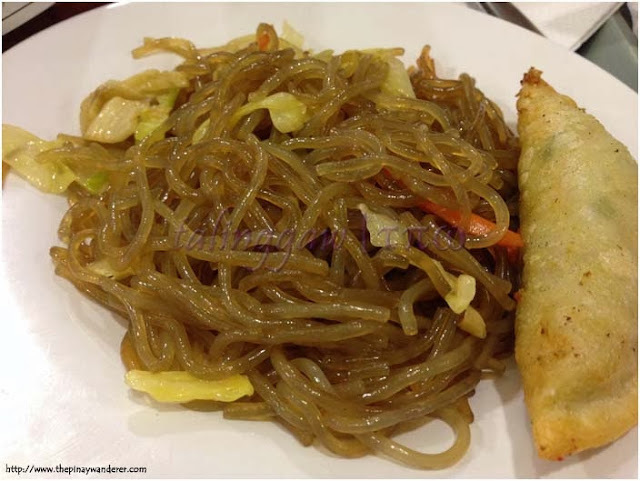 When I ordered bibimbop, I upgraded it to combo meal to have japchae (Korean noodles), Korean dumpling and 12oz softdrinks. For 49 PhP, the upgrade is worth the price. The noodles, though with only a few ingredients, taste good. Even the dumpling. My only disappointment was that it was served cold. It would have been better if it's still hot and crispy (the dumpling, that is). kakagigil sa gutom haha... food trip tayo pls! I have never been fond of anything Korean, so I was kind of hesitant to try it as well. It was surprisingly good, no wonder queues of eager customers are long. Quite delicious to look at...this made me hungry! 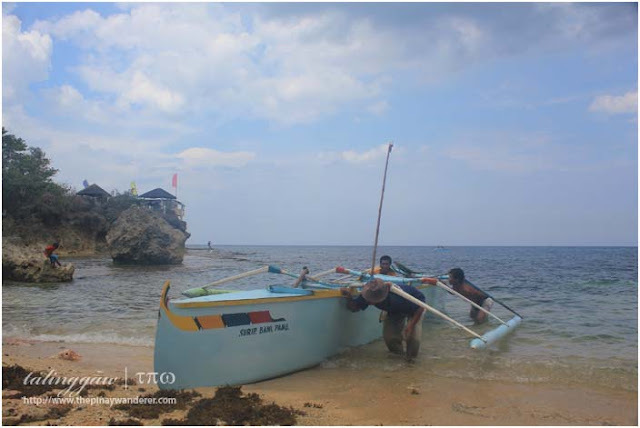 @Gracie: food trip tayo pag-uwi mo...hehe.